Micro-Cide 28 HLD, provides an efficient and safe means for the high-level disinfection or sterilization of medical, ophthalmic, dental and surgical devices including endoscopes and lensed instruments. As with all liquid sterilants, this product should be used for instruments and devices that are heat labile or otherwise incompatible with other methods of biologically monitored sterilization. MICROBIOLOGY: Micro-Cide 28 HLD produces high-level disinfection at room temperature (25¡C) in as little time as 25 minutes and complete sterilization in 10 hours at room temperature (25¡C). Sporicidal Test Bacillus subtillus Clostridium sporogenes Bacteria Staphylococcus aureus Salmonella cholerasuis Pseudomonas aeruginosa Mycobacteria Mycobacterium tuberculosis (var: bovis) Viruses Herpes simplex virus Type I Poliovirus Type I HIV-1 (Associated with AIDS) Fungi Trichophyton mentagrophytes. (Studies were performed after 28 days of simulated reuse following prescribed AOAC testing methods). Clinical / In-Use Studies: Reprocessing flexible fiber endoscopes in use studies supports the effectiveness of Micro-Cide 28 HLD in actual use. (ASTM 1518-94 protocol). In addition, a simulated use-test was conducted to support the contact condition for high-level disinfection of endoscopes at 25¡C at 25 minutes. The results demonstrate the effectiveness of Micro-Cide 28 HLD to kill M.Terrae dried on flexible fiber endoscopes. CHEMISTRY: Micro-Cide 28 HLD is an activated glutaraldehyde liquid chemical sterilant and high-level disinfectant. Its active ingredient is glutaraldehyde in a nominal concentration of 3%. When the powdered activator is added, the solution turns green in color to indicate its readiness for use. In addition to the active ingredient, the ready to use solution contains buffers, wetting agents, a rust inhibitor and a pleasant fragrance. Reusable, non-disposable feeding tubes should be adequately cleaned and disinfected between uses. 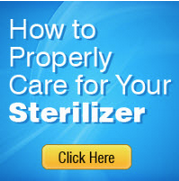 Naturally, the most efficacious process includes thorough cleaning followed by sterilization. In the absence of a sterilization system , high-level disinfection is appropriate since feeding tubes fall into the FDA classification as "non-critical devices" because they are intended to make contact with mucous membranes and are not intended to enter into the vasculature nor make contact with sterile tissue. 1. Thoroughly rinse the interior and exterior of the tube under running warm tap water to remove visible debris. 2. Next, immerse the tube into a basin containing detergent and warm tap water. Micro-Zyme detergent is especially produced for these types of devices. Using a 25cc syringe will allow the cleaning detergent solution to be drawn into the interior of the tube. Several flushes will facilitate the cleaning process. The use of a long brush will allow for the scubbing of the interior lumen and facilitate the removal of debris. Be certain that the interior and exterior are free of visible soil and debris before proceeding to the next step. 3. Next, thoroughly rinse the both the interior and exterior of the tube and and dry. If possible, blow air through the interior lumen to remove water droplets. 4. Immerse the cleaned tube into a solution of Micro-Cide 28 high-level disinfectant that was prepared according to its product label. Using a 25cc syringe, draw the Micro-Cide 28 solution into the interior lumen so as to completely fill the tube with solution along with the interior of the syringe itself. Allow the syringe to remain attached during the soaking period to hold the solution inside of the tube. Removing the syringe will allow the solution to drain back into the basin. Allow the tube and syringe to soak for 25 minutes. 5. At the conclusion of the soak period, detach the syringe from the tube and allow the solution to run back into the soaking basin. Follow with 3 sequential rinses to remove any residual Micro-Cide-28 solution from the tube. 6. Dry the entire xterior and if possible blow filtered warm air through the interior lumen to remove any water droplets. 7. Store in a clean, dry and covered container until next use.